Pundits—and the media at large—nurture and perpetuate the notion that Latinos, particularly Mexicans, are an invading force bent on reconquering land once considered their own. Through a perceived refusal to learn English and an “out of control” birthrate, many say that Latinos are destroying the American way of life. But Chavez questions these assumptions and offers facts to counter the myth that Latinos are a threat to the security and prosperity of our nation. 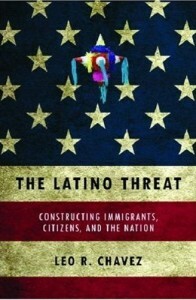 Chavez, Leo R. The Latino Threat: Constructing Immigrants, Citizens, and the Nation. Stanford: Stanford University Press, 2008.